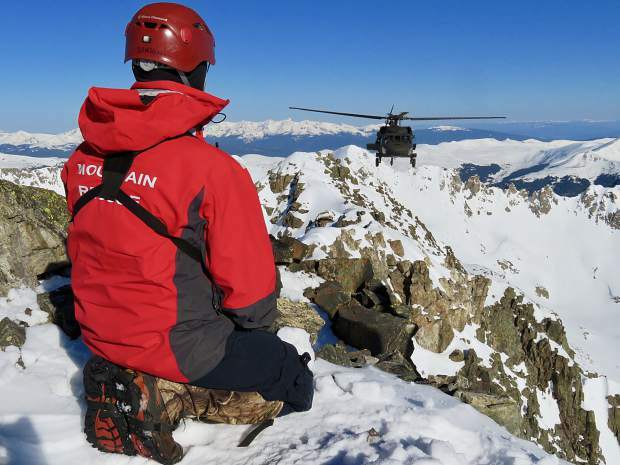 A Summit County Rescue Group team member awaits the arrival of a Blackhawk helicopter provided by the Army National Guard based in Eagle on Monday morning to help two stranded climbers off Quandary Peak. 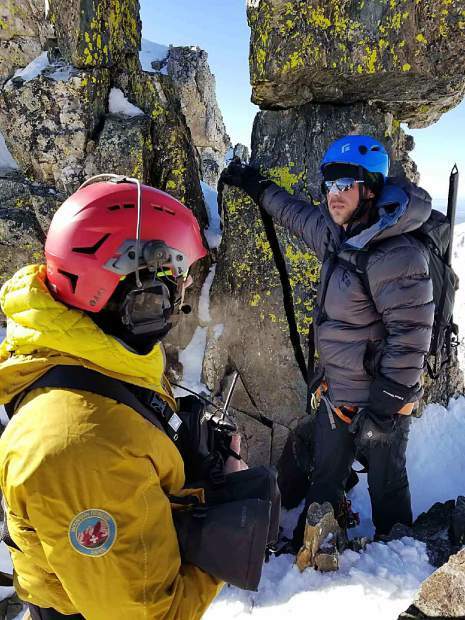 Thomas Ferrara, left, and Eric Hall required rescue off Quandary Peak on Monday morning after becoming cliffed out while climbing the Summit County 14er's difficult West Ridge. In total, the two spent 12 hours overnight stuck and awaiting rescuers just below the crest and more than 21 hours exposed to the elements. 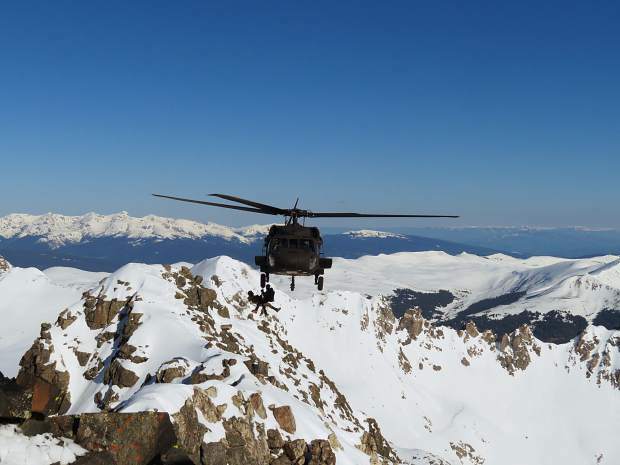 A Blackhawk helicopter from the Army National Guard's High-Altitude Aviation Training Site in Eagle approach Quandary Peak, where two climbers from California were stranded on Sunday evening. 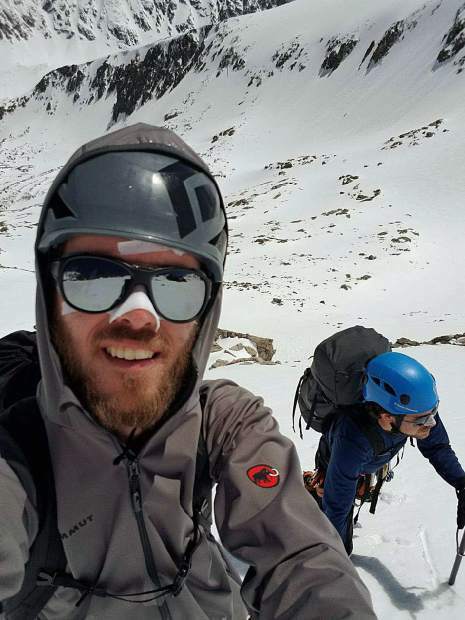 Mountaineers Thomas Ferrara, left, and friend Eric Hall, climbed Quandary Peak along its difficult West Ridge starting Sunday morning, May 28. The trek took a turn for the worse as they approached the 14,000-foot peak's summit, however, and they required emergency rescue on Monday after being stranded overnight. 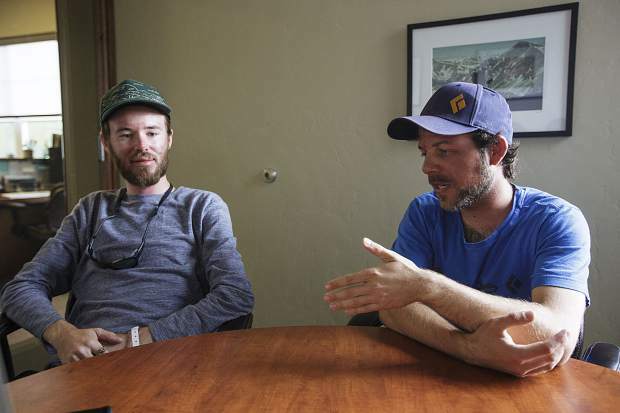 From left to right: Eric Hall, 28, and Thomas Ferrara, 30, both of Bakersfield, California, remain grateful to the Summit County Rescue Group for saving them from near the top of Quandary Peak on Monday morning after an overnight stay due to adverse conditions. A member of Aspen's mountain rescue team assists a Summit County Rescue Group operation to save California climbers Eric Hall and Thomas Ferrara (not pictured) from near the top of Quandary Peak on Monday morning. 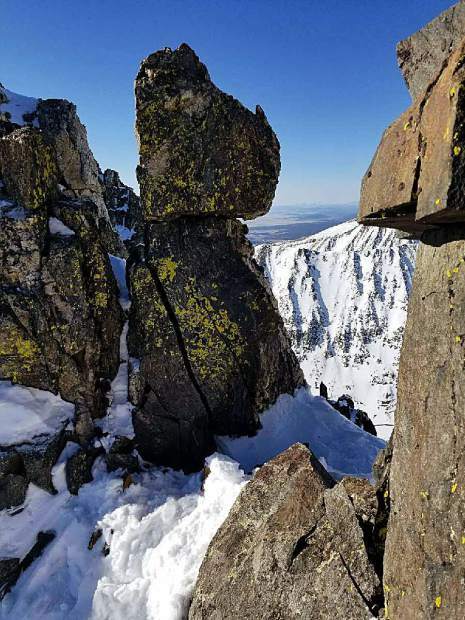 The rescue of two climbers from California on Quandary Peak took an overnight effort for the Summit County Rescue Group, which received assistance from the Army National Guard and Mountain Rescue Aspen. The two men escaped with only sunburns and minor frostbite to their feet. 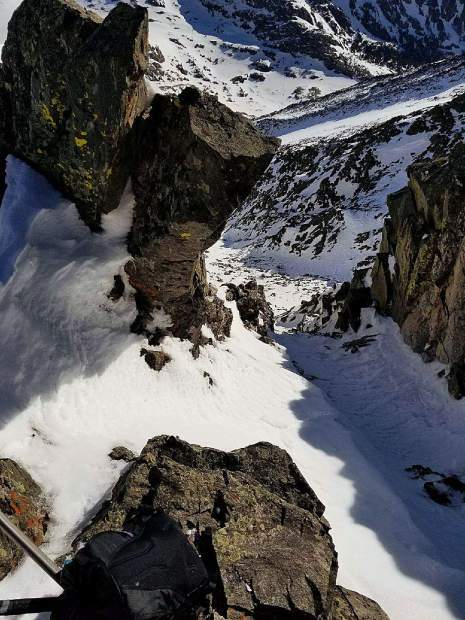 Two California climbers cliffed out roughly 300 feet from the crest of Quandary Peak on Sunday evening. Here, a view of their location along the Summit County 14er's West Ridge route where they hunkered down overnight awaiting rescue. Two California climbers cliffed out roughly 300 feet from the crest of Quandary Peak on Sunday evening. Here, the view looking down from their location along the Summit County 14er's West Ridge route where they hunkered down overnight awaiting rescue. Running on fumes from a demanding climb and dealing with the physical effects of altitude mixed with having exhausted their stock of water, two California men concluded death could be imminent when they called for an emergency rescue off Quandary Peak Sunday night. 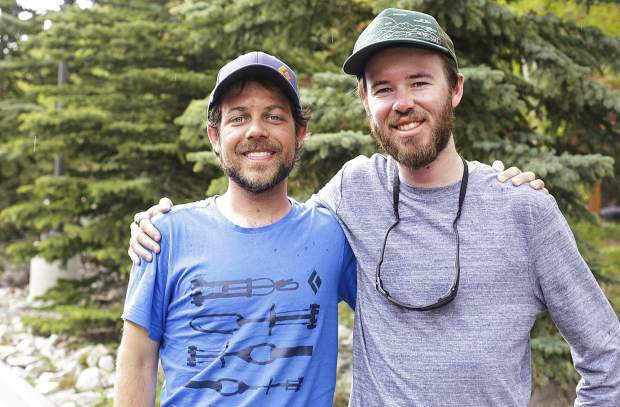 Longtime friends and hiking partners Thomas Ferrara, 30, and Eric Hall, 28, both of Bakersfield, met in Colorado for the holiday weekend in the hopes of a successful trek up the popular Summit County 14er’s West Ridge. The class-three (of five) route traverses more than 2,600 feet of elevation gain over a 2-mile ascent and requires nimble scrambling while overcoming considerable exposure. The two described themselves as “moderately experienced” after a number of past climbs at Yosemite and Sequoia National Parks and the surrounding areas. The Rockies might pose a bigger challenge, but they did their research and departed with their usual cold-weather gear — layers, mountaineer boots, crampons, ice axes and rope — but following a harrowing rescue acknowledged that unexpected conditions and perhaps a hastily planned trip got the best of them. The pair parked their car at the gate off Blue Lakes Road outside of Breckenridge and started into their climb at about 10:45 a.m. on Sunday. They took a leisurely pace with plenty of breaks. The heat proved a surprise given the recent dumpings of snow they’d read about, and they nearly left their heavy jackets behind in the car. By the time they reached a point roughly 300 feet from the summit, they were staring at 60-foot rock faces and felt ill prepared for the final pitch. They were cliffed out as dusk settled in and their energy levels were low with no liquid outside of the occasional icicle. They felt getting back down from the direction they came could mean their demise, so with a dying phone battery but luckily with cell coverage in a notorious dead zone, they dialed 911. The first wave of Summit County Rescue Group volunteers headed out at about 10 p.m. and reached Quandary’s crest via the traditional — and easier — East Ridge around 1:30 in the morning. Hall and Ferrara dug a small trench to escape the wind and the two parties yelled back and forth only able to catch glimpses of headlamps in the pitch black to determine the other’s location. With the assistance of a Flight For Life helicopter, the crew of rescuers judged the situation too risky and told the climbers by phone they’d have to hunker down and try their best to keep moving to stay warm until first light. At dawn, rescuers decided it was still too treacherous to get the two men out via the summit, and sending a team up the West Ridge to reach them also came with its own set of challenges. If it could be organized, an air rescue by military helicopter was the preferred option. A Blackhawk based out of a U.S. Army National Guard site in Eagle arrived to Ferrara and Hall at about 8 a.m. — 21 hours after they’d first left the car. A mountain rescuer out of Aspen was lowered to them and individually hoisted them up to the helicopter to bring the overnight mission to a close. 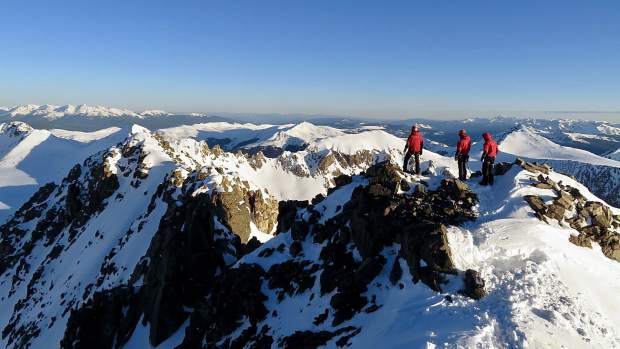 Each climber suffered between first- and second-degree wind and sunburns after mistakenly forgetting the sunscreen as well as minor frostbite to their feet. Able to walk and feeling only cold, they declined an ambulance ride to the St. Anthony Summit Medical Center and stayed the night at a Frisco motel. By morning, Ferrara’s lips sealed shut though, and 24 hours later he still couldn’t feel his toes, so they headed to the hospital for a full evaluation. The next afternoon before making the 15-hour drive back to Bakersfield, the two men were introspective bordering on philosophical in their gratitude simply to be alive. “Life is precious and you only realize it when you’re confronted with death, truly,” said Ferrara. “Because we really didn’t know if we were going to survive the night. Ultimately it’s not about just being out there and doing something great — all those things that draw us to the mountains. All I wanted to do was get off the mountain and talk to my wife again, and talk to my friends.